On US-79N go 4.4 miles northeast of the junction of US-79 and US-69 (Taco Bell) in Jacksonville past the country club and nursery farm. We are on the left at the intersection of US-79 and CR 4208. Turn left onto CR 4208 to enter. Coming from the southwest on US-79, go through Jacksonville for 4.4 miles past the intersection of US-79/US-69. We are on the left at the intersection of US-79 and CR 4208. Look for the sign that reads "Joe Smith Farms Inc." -- we're located soon after that. Coming from the south on US-69, turn right onto US-79N for 4.4 miles. We are on the left at the intersection of US-79 and CR 4208. 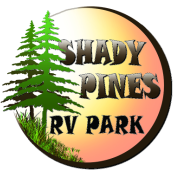 About 1 mile after Mud Creek Off-Road Park, you will see an "Afton Grove" sign and then our "Shady Pines RV Park" sign. Coming from Henderson on US-79, continue through New Summerfield for 6.2 miles, and then just past the Country Charm Candle factory on your left, turn right at the next intersection (CR 4208) into the park entrance. We are at the intersection of US-79N and CR 4208. Coming from Athens on US-175, turn right onto US-69, turn left at Taco Bell and get onto US-79. Continue for 4.4 miles. We are on the left at the intersection of US-79 and CR 4208. Look for the sign that reads "Joe Smith Farms Inc." -- we're located soon after that. Coming from Tyler to Jacksonville on US-69, turn left at Taco Bell onto US-79 and continue 4.4 miles. We are on the left at the intersection of US-79 and CR 4208. Look for the sign that reads "Joe Smith Farms Inc." Soon after, turn left at CR 4208 into the park entrance.